Native to Mexico and Honduras, Morgananium sedum belongs to the Crassulaceae family, a large family of succulent perennials. They are rustic plants and develop in a leaning or creeping way. It is a plant very resistant to arid and rocky environments. Their leaves can be of various kinds, but the most common and the elongated shape of radiant green color. In the summer it produces small, very characteristic flowers, with a star-shaped shape and a light pink color. Flowering goes from March until October. The burrito grown for ornamental purposes, is quite resistant to environments of various types, from hot to cold. It must be cultivated in a hanging vase to allow the plant to form the typical waterfall. It can be kept in both indoor and indoor environments and is easily adapted to. For a more vivid color of the leaves it is advisable to keep it in the sun, also to develop the strongest plant. It must be watered regularly even if excessive watering can lead to plant death. Fertilization is necessary to grow the plant in a robust way, but also to create new branches. La coltivazione avviene per talee, il gambo e le foglie se recise resteranno vive per molti giorni, e piantate in terra, formeranno nuove radici dopo alcuni giorni. - One of the most frequent diseases of sedum morganianum is the cotonose cochineal, a small parasite that hides among the leaves, forming small white areas. It can be easily removed with a cotton swab dipped in some alcohol and rubbed gently on the affected area. After doing this the plant should be rinsed. - If the plant is watered a little, the leaves can become more wrinkled and lose their beautiful color, so you risk to kill the plant. - On the contrary, if the plant is too watered, it may rot quickly. In this case the treatments are not very sufficient. - It may happen that the plant is exposed in very cold environments or with currents of cold air, in this case begins to lose the leaves and becomes faded. It is advisable to place it in a less windy and cold place. The particularity of this plant is in its growth. Normally the plants develop vertically, instead in the case of sedum morganianum the development takes place in a pending way, forming a characteristic cascade of branches and soft leaves, of a length of about 60 cm. Recommended to plant them in pots or baskets resting on window sills or balconies to give a truly beautiful and unique suspended effect. 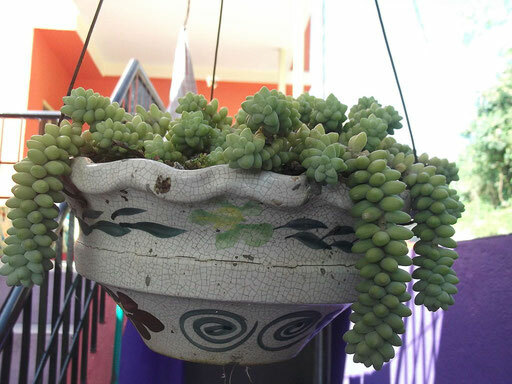 Hanging them from the ceiling of a porch or a balcony is really an excellent idea to beautify our home garden. Very characteristic is also to create a composition, to plant together with the sedum morganianum other similar species, in order to create a beautiful effect of colors. In recent years, given the particular resistance of the plant, along with other similar species is used to embellish the roofs of houses.